Here I was, weeping, alternately pacing the aisles and lying on the altar, all alone in the church after everyone else had gone home. I begged God to show me just one verse in His Word that I could use to justify leaving my husband. I was done. I hadn’t always felt this way. I met my husband when I was fourteen years old, and I knew when I saw him I would marry him. We married once I graduated high school and began life together with a baby and a move to another state, away from all I had ever known. He found it hard to keep a job, and something happened that I didn’t expect. I began to not like this man very much. I disliked his job-hopping. I disliked that fact that he had made us move away. I disliked his spending. I disliked how he spoke to our daughter. This marriage business was hard. Why couldn’t he just stand up and be a man and take care of us like he was supposed to? After several years, we moved back home, and my mother began to invite me to a church she was attending. At first, I dismissed her. After weeks of asking, though, I finally gave in and found myself in a little church. Something was different here. These people actually tried to live what they heard on Sundays. They talked about their failures, and there was no shame, only forgiveness. No grudges, only reconciliation. To an unsaved young woman, educated and bitter, this all seemed too weird. For two years, I attended ladies’ classes and ladies’ retreats, sat in on prayer meetings, and learned to trust the elder women in this church. Through their example, God turned my heart to Him and I was wonderfully saved. One area still bothered me though. The women talked of how they loved their husbands, what great men they were, how thankful they were for them. Each comment made me ache. How could they have such perfect marriages and mine be such a disaster? And then the darkness came. My husband had suffered a debilitating injury and was required to have a dangerous surgery. The risks were high, the doctors said, and recovery would take months. Even if the surgery were a success, there could be side effects that would affect my husband permanently. Then only three months after his surgery, Hurricane Katrina came. Our home flooded, and there was no money to repair it. My husband fell into depression and stayed on the computer constantly. I would get up in the morning and see him in front of the screen; come home from work, there he was; and go to bed, with him never coming out of the office. There was no intimacy between us, either emotional or physical. We were roommates, not husband and wife. And it wasn’t long after that that the tempter came in the form of a man, a man who smiled at me and told me I was beautiful and how much better he would treat me if he had me. It was only by the grace of God that I didn’t fall completely. It was my Father Who protected me, not my vows or my fear of what others would say if they found out. I was long past caring about any of that. I was wrapped up in my own longings and disillusionment. And now here I was, depressed, broken, alone at the altar in that little church. I picked up my Bible, barely able to see through my tears. I opened it up randomly and began flipping the pages, going to the places that I knew taught on divorce, hoping I would find a verse that would justify my leaving. The first place I found myself was Matthew 5—divorce allowed only in the case of fornication (v.32). He hadn’t cheated on me, so that was out. WHAT??!! I’m supposed to love and submit to my husband even if he’s not saved?? God, I know You know how this man is, and this can’t apply to me. I’ll try again. And then, I Corinthians 7. Not exactly what I was looking for, but I read on anyway. Perhaps there were exceptions. My tears were beginning to dry, not because I found peace, but because I was angry. Why can’t I leave him? Does God expect me to live in this despair, this heartache forever? I slammed the Bible shut, then re-opened it. I was so ashamed, and I am ashamed again as I write this. He had just had to walk through the darkest months of his life, and while I had done what was necessary to help him physically, I had abandoned him emotionally. I had committed adultery in my heart and justified it. I, his wife, the one he had chosen to walk through life with, had already left him. So now I had a decision to make. Would I obey the words that my Father had so gently, but firmly, brought to my attention? Or would I forever damage my daughter and my testimony for my selfishness? I am glad to say that my Lord gave me the courage to walk in His truth. This was not an overnight change in my heart, but a day-to-day commitment that I would be a daughter my Father would be proud of. 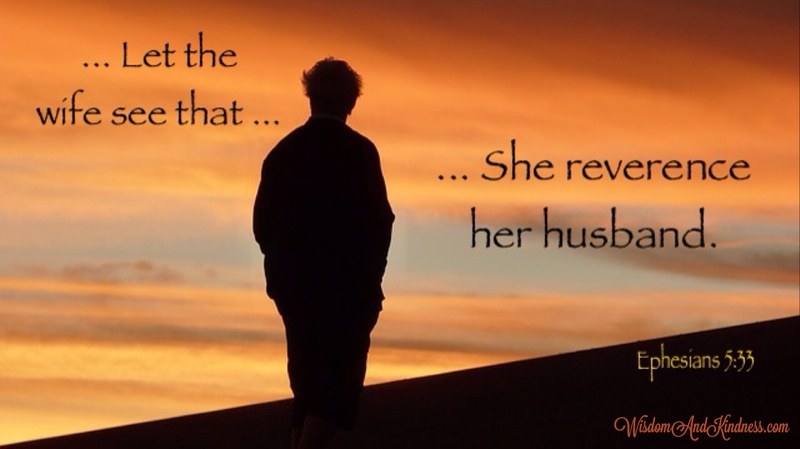 I resolved that I would no longer speak negatively about my husband to anyone. When discussions began to turn ugly, I would close my mouth and refuse to rise to the bait. I would make myself available to help him and listen to him and love him. Over time, I saw my Lord bless His Word. My husband was saved, and our marriage was renewed gloriously. The defining point in our renewal was the night God pressed upon my heart to tell my husband about the other man. Oh, how worried and afraid I was! But I knew that in order for us to truly be one, there could be no more secrets. What happened that night cemented my love for my husband and for my Jesus. I saw my husband’s heart break as I told him of my betrayal, and I saw the battle he fought within his mind. Then, I heard the sweetest words I’ve ever heard: “I already knew. I love you, and I always will. I forgive you.” And he really did. He never brought the subject up again, and his actions toward me afterward never held any bitterness. I cannot express to you what the Lord worked in my heart that night, but what I do know is that the man I was so determined to leave became the man who showed me the love of Jesus like I had never known. The Lord has shaped my husband into a leader, an innovator, a man with talent, compassion, strength, and grace, and I have seen through him the clearest picture of Christ’s forgiveness and love. Just one verse. That’s all I thought I needed. But God had given me so much more. He gave me truth. He gave me love. And by His grace and mercy alone, He gave me a true marriage. Have you ever taken time to just meditate on a single verse of Scripture? One morning, as I sat giving thought to a scripture, the Lord spoke so clearly to my heart. A simple sequence of questions and answers brought my thoughts – and heart – to a very special place. What is the result of being a strong woman? … She becomes a crown to her husband. What was the purpose of a crown? … To exalt one to a position of honor. 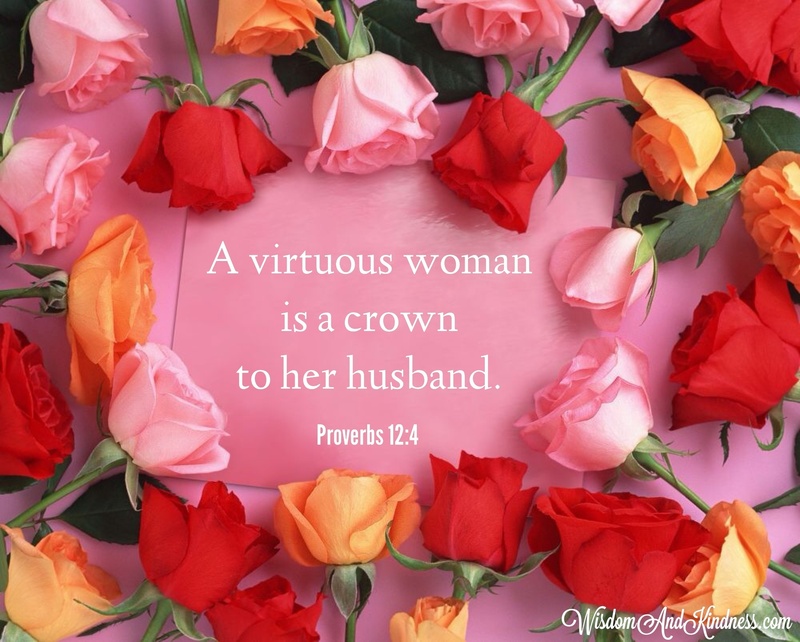 What was true of the husband of the Proverbs 31 woman? … Her husband was known in the gates. I could see that this verse was saying that a strong wife would exalt her husband. I knew that it takes humility to exalt another above oneself, but I could feel The Lord calling me to do exactly that. I was to exalt my husband to the position for which The Lord had created him. As I pondered the implications of this truth, my attention was drawn to the contrasting wife. How was the wife described who is the opposite of this virtuous wife? … She makes ashamed and is as rottenness in his bones. Did I exalt my husband or did I degrade him? And what happened if I degraded him? … I would be as rottenness in his bones. What does rottenness do? … It causes slow, often unseen decay. Where does this rottenness occur? … In his bones. What is the purpose of bones to our body? … Unseen strength and support. What was the woman made from? … From the bone of the man. Could it be that the wife is to be strength and support to her husband as she exalts him rather than a cause of inner decay within him? I knew that the Lord Himself is to be a man’s source of strength, but I could also recall that The Lord made the wife especially as a help for him. I could see that by my actions and by my words, I would either exalt and honor my husband or I would inwardly destroy him. By what I said to him and about him, I would either build him up or tear him down. Then I remembered that virtuous woman of Proverbs 31. The heart of her husband had confidence in her because she did him good, and not evil, all the days of her life. I thought some more. I actually could be a crown to my husband. I knew I would need the Lord’s help. But somewhere in my heart, I simply heard: You can be a crown! What do you suppose you would find if you looked inside your husband’s heart – not in his physical heart, but in his spiritual heart? You may immediately think of numerous answers to that question – some of those things perhaps very good and other things perhaps not so good. But the matter of consideration for the wife is what is in her husband’s heart concerning her. You may think that it is impossible to know what is in someone’s heart – but not so! The Scriptures teach that out of the abundance of the heart the mouth speaketh (Matthew 12:34). It is by listening – truly listening – to what our husbands say that we can actually know what is in their hearts. 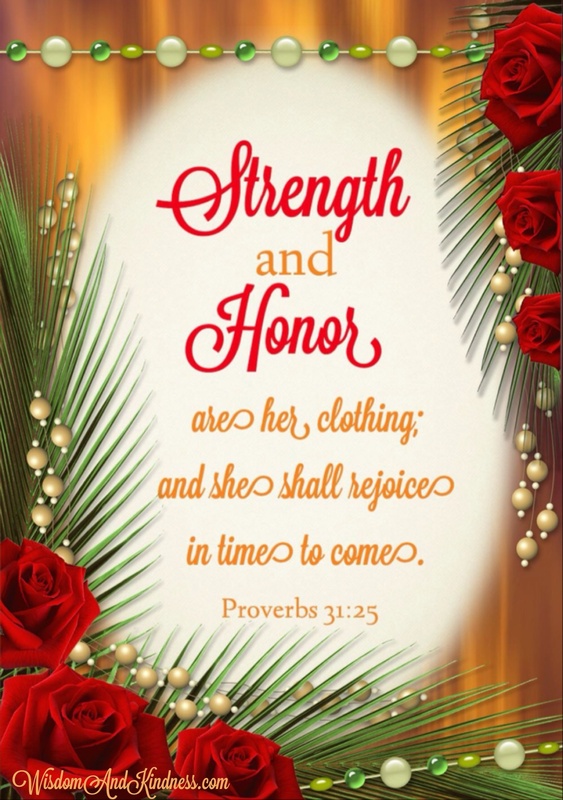 The Proverbs 31 wife is a wonderful example to all Christian wives: The heart of her husband doth safely trust in her. What kind of trust does this husband have for his wife? And what is it that causes this type of trust to develop? Understanding the meaning of the phrase safely trust will prove helpful. This phrase is actually one word in the Hebrew, but was translated as two words in English to emphasize the level of trust that this husband feels toward his wife. Safely trusts means: to attach oneself to; to be confident in; to be secure in. The basic meaning is: to rely upon. This Proverbs 31 wife is indeed trustworthy. It is important to note that this level of trust does not happen instantaneously. It is a firm, solid trust that develops over time, as the wife has proved constant in her attitudes and actions toward the husband. She will do him good and not evil all the days of her life (Proverbs 31:12). She is there faithfully being a help meet for her husband (Genesis 2:18). It is through this constant companionship and support that a deep level of trust develops day by day by day. No matter what the husband may have to face in the world or who may prove untrustworthy in his day-to-day interactions, the wife is there by his side, though often unseen, giving silent support. And the husband knows that he can trust in her. He knows that he can rely upon her. He knows that he can count on her. What of the husband who lacks this type of trust in his wife? Though the reasons are varied, perhaps the most common reason is that there is no consistency in her relationship to her husband. The husband may not know from day to day, or even from minute to minute, what his wife’s attitudes or actions may be. As he comes home from work, he is never sure of what will greet him upon his arrival. Because of the uncertainty, he lacks a confident reliance upon her. The heart of her husband doth safely trust in her. Did you know that it is impossible to change someone’s heart? But for the wife who desires to build a deeper level of trust in her husband’s heart, there is a sure way. The Word of God gives clear instruction for the Christian wife, and as the wife walks more and more consistently in the truths of the Word of God, an amazing thing happens. Safe trust in her grows in her husband’s heart. And even more amazingly, as the husband sees Who it is that gives her such stability, he will often realize just how trustworthy her Lord is! What are those truths given directly to the Christian wife? She is to love her husband (Titus 2:4), she is to respect her husband (Ephesians 5:33), and she is to subject herself unto her husband (Ephesians 5:24). Without fail, these truths, as they are lived out in the wife’s life by the power of the Spirit of God, will foster an incredible trust in the heart of a husband. God is faithful, and He works through His Word! 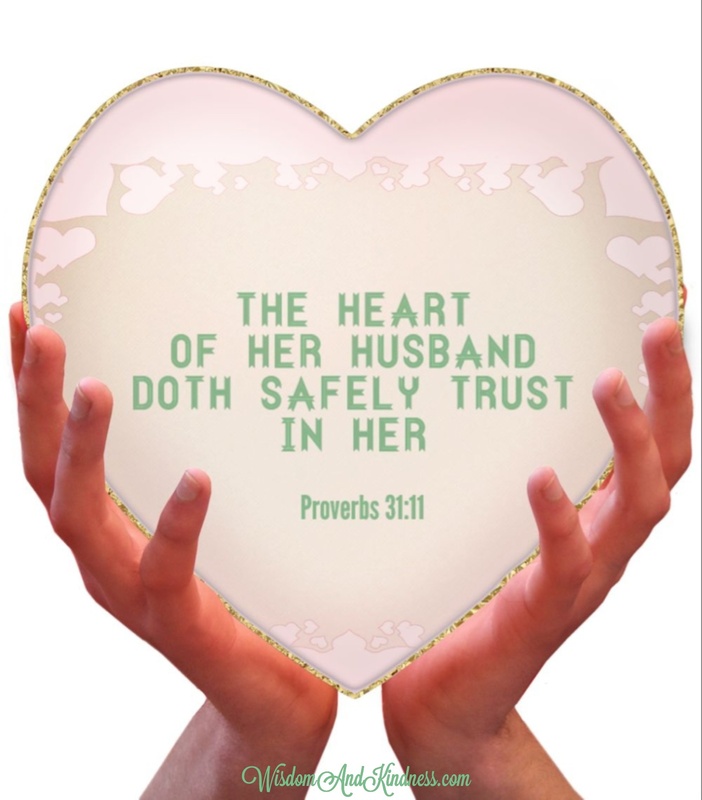 Does your husband’s heart safely trust in you? Can he count on you for companionship? Can he trust that you will be a help to him? Does he know that each and every day you will do him good and not evil? Does he know that you are his greatest supporter? Can he consistently sense your respect for him in the things that you do for him and in the things that you say to and about him? Does he know that you will follow his leadership? 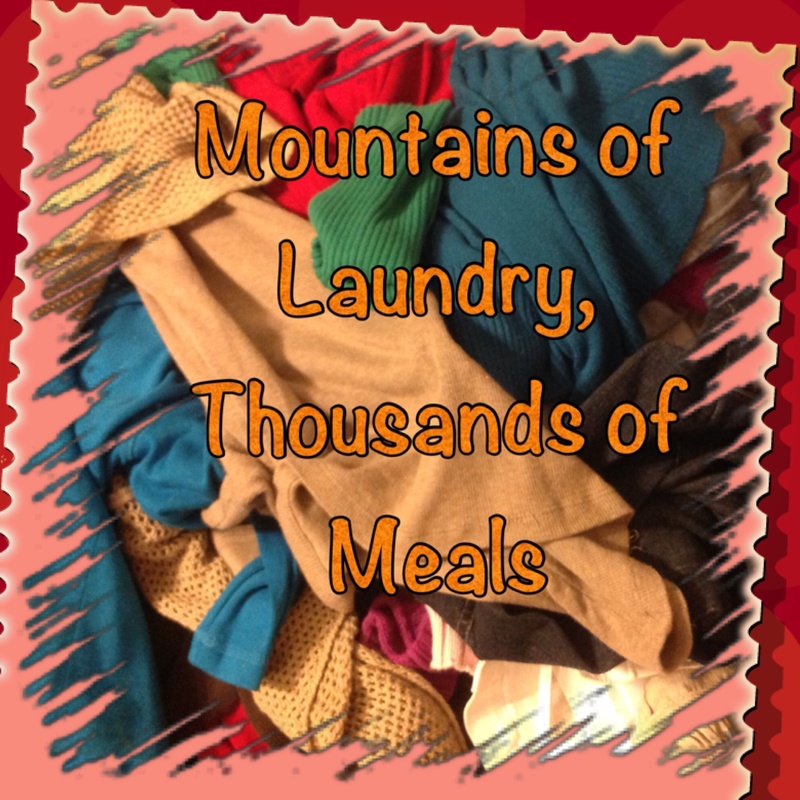 Is he sure, without a doubt, that you will care for his needs – preparing food and clothing for him? Is he certain that you will faithfully care for the children? Does he know that you are thankful for the home that he has provided and that you will keep it carefully? Can he trust that when he reaches out to you for intimacy that you will respond positively to his need? Can he rely upon you to spend money wisely? The questions are many. Take them before the Lord in prayer. Allow Him to bring to your remembrance the truth of His Word, along with comments that your husband has made. Allow Him to show your husband’s heart to you by the things that he has said. Then listen carefully as the Spirit of God applies truth to your life. The heart of her husband doth safely trust in her. Why? Because she does him good and not evil all the days of her life. For all the city of my people doth know that thou art a virtuous woman. The above article was first printed in Dawning Light © 2004.